Were they journalists? Were they activists? Who cares! They became witnesses. Being a journalist or being whatsoever depends on how you feel. It is an ethical responsibility that you manage to share with a wider audience what you and those who are around you are going through. It will be the result of your work that will lead you to a professional career as a journalist or not, rather than pre-assumptions and labels. Make them know. Make those who you want to: listen and be aware of what you are aware of. That is a journalist. Having a card, with “press” written on it, or getting a regular salary is not necessary to be a witness with a camera or a pen. Forget about neutrality. Forget about objectivity. 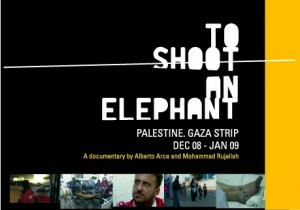 They are not Palestinians. They are not Israelis. They are not impartial. They only try to be honest and report what they see and what they know. In Gaza´s case, no “official journalists” were authorized to enter Gaza (apart from those who were already inside) so they became witnesses. With a whole set of responsibilities as regarding to it. 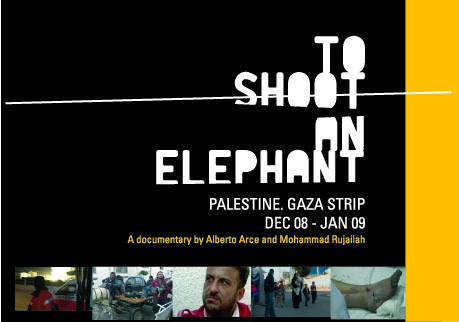 “To shoot an elephant” work group is a collective, asambleary, autónomous and community-based project. They haven’t been funded by any government or supported by any private business. Donations are welcome!